After causing myself achilles tendonitis in both Achilles tendons in spring 2016, I basically lost a year of running. Here, you’ll find basically my fitness journal, starting 9.1.2017. My initial posts will chronicle my efforts to restart my fitness, return to sub-10 percent body-fat, and become stronger, more lean, and with better overall physical endurance than ever before in my life. As I rebuild my blog, and try and give you a reason to read mine over the millions of others out there, I felt the need to make this particular post my first. I hope, by the end, you’ll understand why. 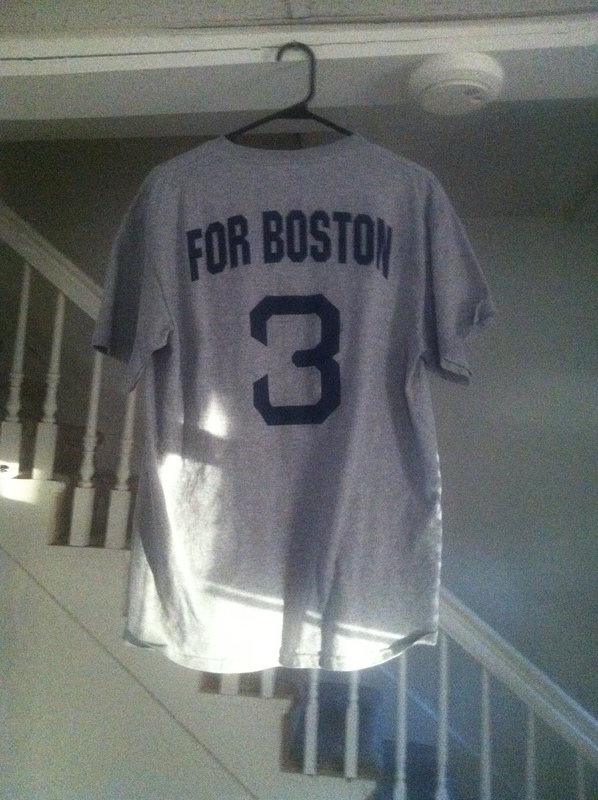 Today, I introduce you to my “3 For Boston” campaign. On April 15th of 2013, two explosions rocked the Boston Marathon near the finish line of the race. It was a day of tragedy in Boston. Many were hurt, and three people died in the blasts. In the days that followed, Boston was locked own and a manhunt began, leading to two suspects being discovered, one of which was killed in the hunt, the other who was captured. Runners everywhere were shocked and angered and hurt. For many of us, this was a low blow. The running community is a very tight knit group that welcomes newcomers and thrives on the differences of each member. Seeing a race that so many of us train for and dream of running attacked this way was a shot right to the heart of many of us. That day, I was going about my daily soldier tasks at Fort Bliss. I was an active duty soldier who was scheduled to leave active service a little over six weeks later. I was at the Army Community Services building when a CNN alert came over my phone, informing me of what happened. I went over to my unit building and watched things unfold on the big screen TV which was set up. As the reports came in about injuries, then the rumor of a first casualty, then a second, and then a third, I was hurt and enraged. How dare a terrorist attack something like that! How dare they come after runners that way! Running is a lifestyle, but runners are not, in that, violent people. They’re people who strive for excellence, who strive to conquer their demons and overcome their own limits, whether those are real or perceived. In other words, this was not terrorists attacking armed soldiers. This was terrorism at it’s worst, attacking unarmed, unknowing CIVILIANS in the gold of day in one of America’s most iconic cities. This was three spectators being killed, including an eight year old boy who was there with his family. This angered and upset me. It even brought me to tears when I went to bed that evening. I know it’s silly. I mean I didn’t know anyone there, I wasn’t from Boston and I had no real ties to it all. But I am, and I was then, an aspiring runner. That was the community I felt most attached to, and somehow I hurt for them. I can’t explain it. So why does all this matter. Well, that week I realized I had to do something. As a professing Christian, I have been through enough and seen enough to believe in the power of prayer. One of the most emphasized themes in the Bible is the idea that we should pray about everything (Romans 12:12 for instance). So, as I sat there in my room that evening, I decided I needed to do something to pay respects to the victims and their families. Something public, but not for my glory in any way. Something that would bring awareness to those around me, as well as give me a firm reminder myself. I wracked my head for ideas, and ultimately decided to sleep on it. The next morning I woke up with the idea. I drew it up in my head, and texted my two or three best friends for input. Alyssa loved it, which was enough for me to get online and order a custom shirt from the Boston Red Sox official online store. That’s the shirt in the photo. Here was the idea. From April 15th 2013 until the end of the 2014 Boston Marathon, I will wear that shirt as my official race shirt. The 3 signifies each of the victims, and my commitment to running 3 Half Marathons in that time, or 3 races over that distance (such as a full Marathon, and a half). I ran the Prairie Fire Half-Marathon in October of 2013, and I’m registered and scheduled to run the 2014 Austin full Marathon on February 16th. But in my opinion, it really is. That’s why I run this year. That’s why I run with the hope of reminding others not to forget those families. Because those who were hurt, and those who died, on the unspeakable day of April 15th, 2013, will never be forgotten by their families and friends. We, as a society, as runners, and as Americans, but remind them that we will never forget them either.